I come from Serbia and am now living in Sweden. 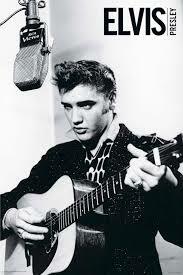 All my life I have been a fan of Elvis, so I had a big Elvis Presley poster on my door. It had been there for about two years and one evening the poster fell down on the floor. I hung it up again, it fell down again. I cleaned the door and hung it up again, and it still fell down. I did the same about 10 times. The last time I threw it in the basket and went to bed. The first thing I heard on the radio the next morning was that Elvis died in his home – the same evening when my poster fell to the floor.